What a silly sausage I am! Here I was, rejoicing at the cessation of slavery in the West Indies in 1834 but I need not have worried. Why, slaves received a weekly allowance, a home, they were fed, their clothes were washed and mended, they received free medical care and their children need not be a burden to them! They ate well from their own allotments and if they dressed in rags in the fields- well! they had plenty of rich, colourful clothes at home! They looked forward to the sugar harvesting time and the boiling-house, instead of being a satanic hell-hole was instead a scene of great merriment with young and old gathering there, singing songs, telling jokes, sitting down enjoying themselves, roasting and eating yams and plantains. Who wouldn’t want to be a slave? Well, that’s the way that Mrs A. C. Carmichael tells it, anyway. This two-volume book was published in 1833, eight years before her Tales of a Grandmother that I reviewed earlier. This is in effect the ‘grown-up’ version of her later children’s book: I find myself wondering at a world where there was a perceived need for a children’s pro-slavery tract. So who was this Mrs Carmichael? According to a very interesting article by Karina Williamson, published in the International Journal of Scottish Literature in 2008 (see here) she was Alison Charles Stewart who migrated to the West Indies with her two young daughters to live on the plantation owned by her husband John Wilson Carmichael, who had been assigned to St Vincent with the 53rd regiment in the 1790s. He had married his first wife in St Vincent and became an absentee proprietor when he returned to England. He was considerably older than Mrs Carmichael, and had two daughters from his first marriage. Mrs Carmichael was married in Edinburgh, where she lived prior to her shift to the West Indies and on her return ‘home’, she spent the rest of her long life as an expatriate Scot in England or the Channel Islands. The book was written with the clear intent to rebut the abolitionist rhetoric about slavery circulating in England, and is best regarded in that light. Hence the heavy emphasis on the ignorance of English commentators, the great progress that had been made in ameliorating the conditions of the slaves, the unreadiness of the slaves for emancipation, and their happiness with conditions as they were. It is very much a book of its time, written for a particular political purpose, and it comes across to a modern reader as a missive from a discombobulating parallel universe. Additional reference: Karina Williamson ‘Mrs Carmichael A Scotswoman in the West Indies’ International Journal of Scottish Literature Issue 4, Spring/Summer 2008. It was Christmas Eve, and twelve-year old Maria and her 22 year old brother Frederick Manners were sitting by the blazing fire with their parents and their grandparents who were visiting from Devonshire. Well, give me the Christmas Day Queen’s Message and the X-box anyday! Grandmama didn’t need much encouragement to launch into this long, didactic exposition of her childhood Christmases, heavily larded with Good Christian Precepts and Useful Knowledge, prompted by earnest questions about plants, climate and geography raised by these smarmy children. I had quite an urge to tip Grandmama and her rocking chair into the blazing fire and toss in her snotty grandchildren after her. In spite of this, however, it was a rather engaging way to read of nineteenth-century West Indian life, which was of course the reason for me reading the book in the first place. Young Grandmama spent about nine years in St Vincent in the West Indies on a plantation, before returning to England impoverished as the result of the perfidy of their white plantation-owning West Indian neighbours. 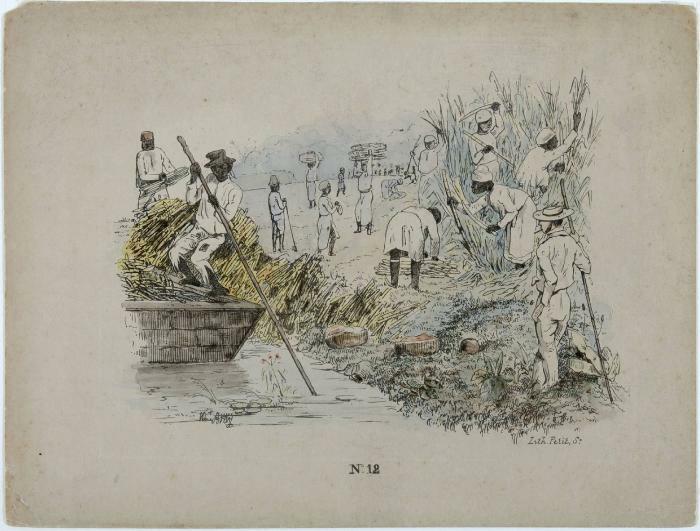 The book is imbued with a strong pro-slavery flavour: she refers to ‘our negroes’ as a cheerful, singing lot, reserving the s-(lave) word only for the avaricious plantation managers who took advantage of their financial misfortune to break up the happy menage. Grandmama is severely critical of the irresponsible Harris family on the neighbouring plantation, who allowed their daughters to run wild with the expectation of sending them back to England to polish them off for marriage, and whose double-dealing placed Grandmama and her family at the mercy of merchants and their attorneys back ‘home’. The book fleshed out for me the social life of the white plantation elite and the financial arrangements between the metropolitan merchants and the colonial plantation owners. Despite the clunkiness and smarmyness of the children’s questions (“What’s a calibash, Grandmama?”) I learned probably more than I wanted to about West Indian plant life and geography, and in a relatively painless fashion. This book lurks in the depths of the Internet Archive and is available here should you crave some worthy, educational mid-Victorian story-telling from Grandmama.